In the 1930s, engineers with L.A.’s Department of Water and Power performed their most impressive trick yet: they made an entire dam disappear. In 1932, the white concrete face of Mulholland Dam loomed above the town of Hollywood, holding back Lake Hollywood and its theoretical capacity of 7,500 acre-feet of water, or nearly two and a half billion gallons. By 1934, the dam had vanished beneath some 300,000 yards of dirt and the fast-growing trees planted in it. You could still see its reservoir from above, but from below the dam looked simply like another landscaped hillside. Why would the DWP want to hide this gleaming monument to modern engineering, designed to be a conspicuous feature of the Hollywood Hills landscape? After all, it had only been a few years since city officials gathered atop the structure to honor its chief architect (and the chief architect of L.A.’s entire water delivery system), William Mulholland. That, however, was before the catastrophic collapse in 1928 of the city’s St. Francis Dam. Across Los Angeles, Mulholland’s reputation crumbled overnight. In Hollywood, where residents had opposed the Mulholland Dam since its inception, the disaster raised fears that Lake Hollywood might soon wash away the movie capital. Panel after investigative panel inspected the Hollywood Dam—like the structure in San Francisquito Canyon, a concrete gravity dam—and declared it safe, but the city chose to retrofit it anyway. Earthmovers slowly piled tons and tons of earth atop its downstream face, and the dam disappeared into the Hollywood Hills. 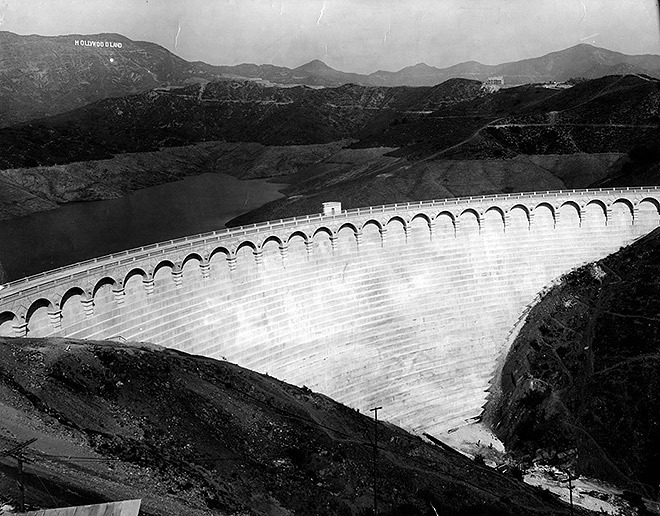 Above: Hollywood’s Mulholland Dam 1929, before it blended into the Hollywood Hills. Courtesy of the Herald-Examiner Collection – Los Angeles Public Library.